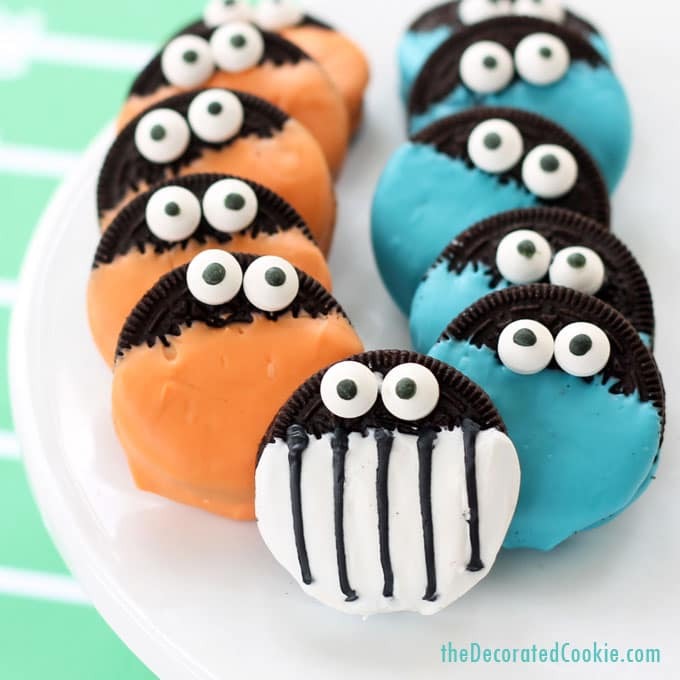 Dress your chocolate covered Oreo players in any of your favorite sports teams’ colors. 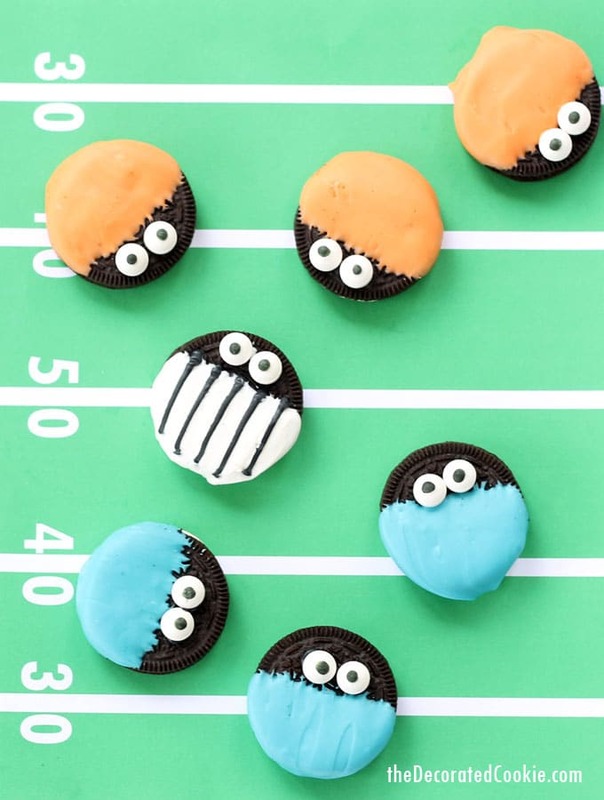 Here, the sports team Oreos are football players, but you can use this idea for any sport. 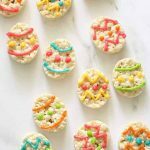 Disclaimer: This post is sponsored by Wilton, which is really handy, because I actually use and love all these Wilton products I suggest below. Sports and me, we don’t usually mix. I played tennis for years, so there’s that, and I even used to sort of enjoy watching it. But I go to a sports game thing only for the beer and hot pretzels and the thrill of stadium seating. That’s it. If I host a sports-themed party, I’m in the dining room gossiping over wine, not on the couch yelling at players and throwing pretzels at the TV. That said, as one with a husband who IS rather emotionally involved in every sport that has ever been played and/or shown on television, I do understand the passion sports engenders, especially the love or hate of particular teams. 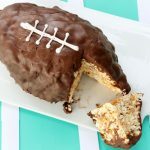 And luckily, since I’m less invested in who wins what, I’m much more free to make sports treats for those of you who are invested. 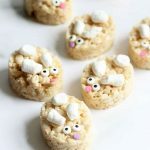 While I may not cheer at the screen, I do get that excited over fun food treats. 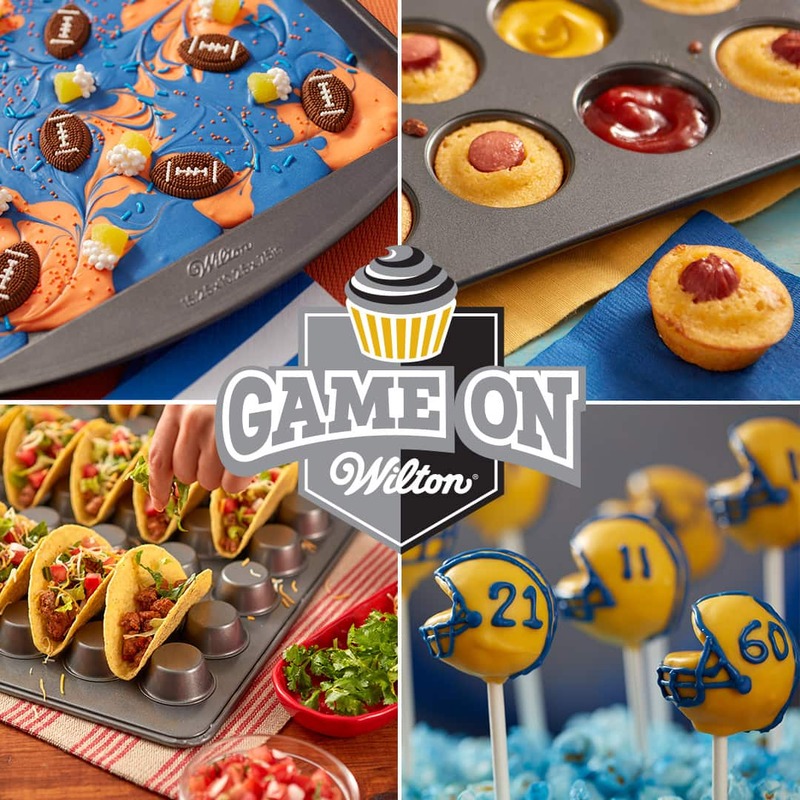 Check out ALL the super awesome sporty party ideas over at Wilton’s GAME ON. I’d be the sportiest sports fan ever if I could always edible foot shot glasses with me. I went with an Oreo face-off. Who will win? 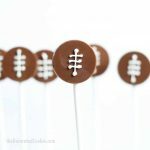 These chocolate-covered Oreo team players (in this case, football player Oreos) are so freaking cute AND easy to make that you can whip them up for any sports thingamajig you have. Kid on a team? 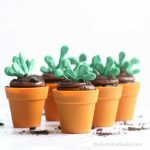 Bring these to the end of year party in colors that match their uniforms. Hosting a game viewing party? 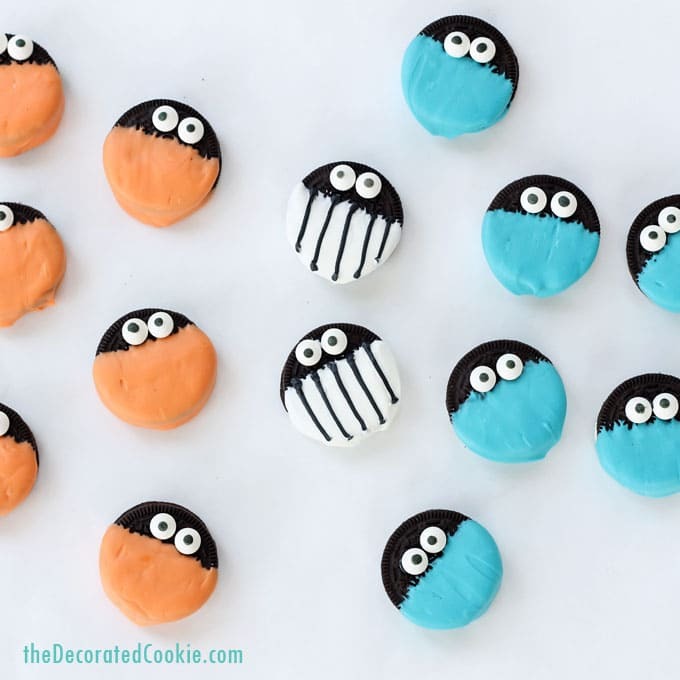 Serve these on a plate arranged as opposing teams with the referees in the center. 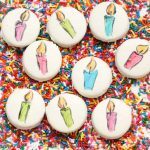 Wilton candy melts come in every color, so you shouldn’t have a hard time finding just the right colors to advertise your team support. Wilton even made some team color kits for you to make it easy. 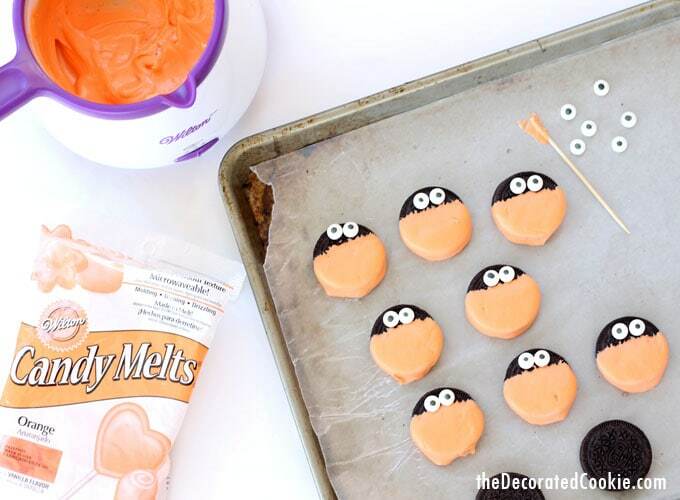 *Find Wilton candy melts in the craft store or online. 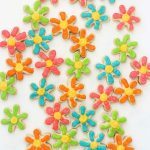 The EZ Thins help to thin melted candy melts for easier dipping, but it is optional. If you do not have a candy melting pot, you may use a microwave-safe bowl and melt the candy melts according to package direction. 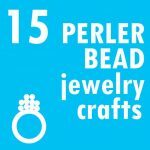 Click the links above to see the products. 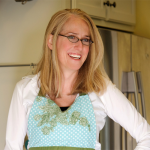 what to do: Line a baking tray with wax or parchment paper and set aside. Melt a team color of candy melts (I work with about 1 cup at a time, but you may use the entire bag of candy melts if you like) with a tablespoon of EZ thins (if using) in the candy melting pot or in a bowl in the microwave. Hold an Oreo at the top and dip the Oreo in the melted candy melts, leaving the top quarter of the Oreo uncovered. Rest the Oreo on the baking tray. Finish dipping as many Oreos as you need. 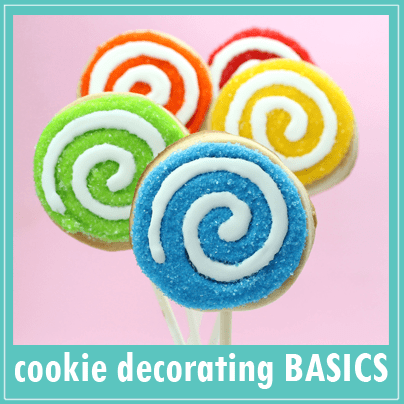 Use a toothpick to dab melted candy melts on the back of candy eyes and adhere to the top of the Oreo and let set about an hour. Repeat with another team color if you like. 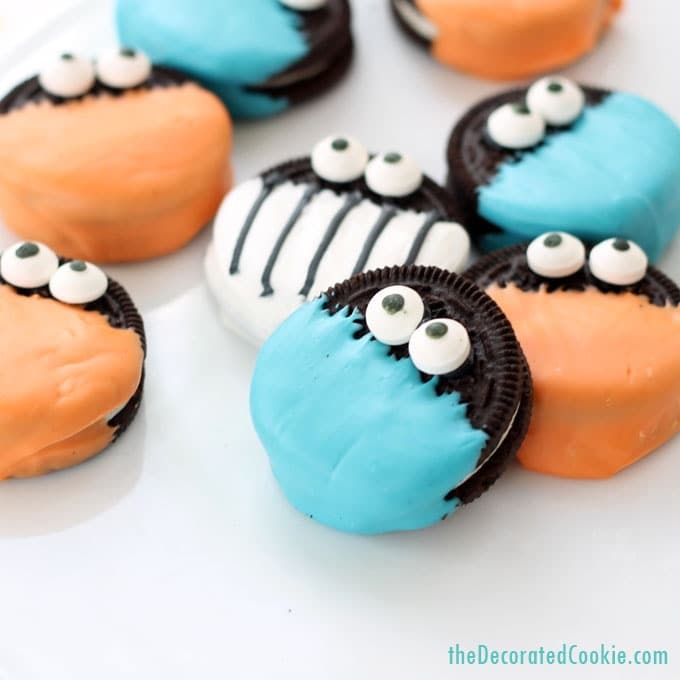 To make the referees, dip the Oreo in white candy melts and adhere the eyes as above. Let set. Place a handful of black candy melts in a disposable decorating bag. Melt for 90 seconds at 70 percent power. Massage the bag and, if needed, continue to microwave in 15 second intervals until fully melted. Snip a bit off of the tip of the bag and pipe stripes on top of the white candy melts. Let set.